You are here: Home » Blog » Daily News » Malini Schueller’s IN HIS OWN HOME doc short wins Chicago (In)Justice For All Fest! IN HIS OWN HOME directed by Malini Johar Schueller has won the Short Film Special Recognition Award along with two other distinct projects at the Chicago (In)Justice For All Fest. In total the fest featured over 40 films, in 16 venues. 10 filmmakers came to support their films, from as far away as California and Vancouver. The goal of the festival is to expose people to justice issues. While the fest focuses primarily on the epidemic of mass incarceration, the root causes, the challenges and potential solutions, they also extend the parameters a bit to provide light on other human rights concerns.When heavily armed campus police broke into the University of Florida campus apartment of disabled and unarmed Ghanaian doctoral student Kofi Adu-Brempong, and within a minute of entry shot him in the face, his life was forever changed. Yet the officer who shot him, who had previously been caught cruising through town throwing eggs at residents of a Black neighborhood, was neither suspended nor fired. This documentary is about the ongoing pattern of police brutality against Blacks–from Gainesville to Ferguson to New York– and the dangers of over militarized campuses. 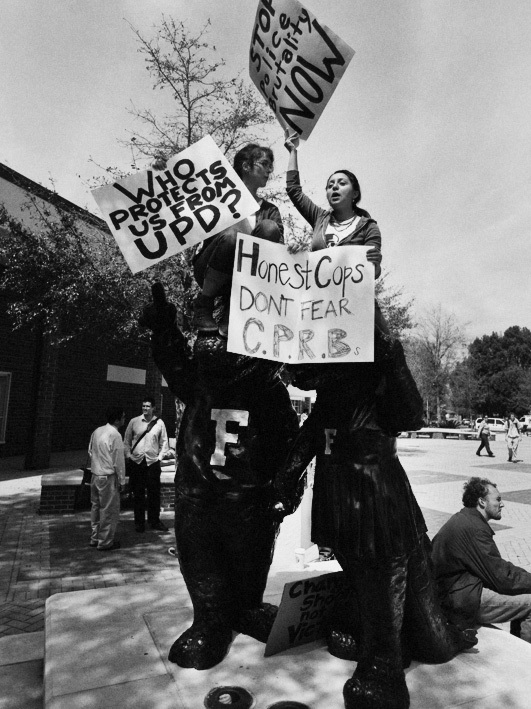 It is about student protests that led to the administration dropping charges against Kofi and about continuing student efforts to revoke SWAT-like teams on campus and to establish police review boards. Schueller received her MA from Panjab University, India, in 1979 and her PhD from Purdue University in 1986. A member of the UF faculty since 1986, she is the author of several books. Her first book, The Politics of Voice: Liberalism and Social Criticism from Franklin to Kingston (SUNY, 1992) was a Bakhtinian reading of selected American autobiographies. Her second book, U.S. Orientalisms: Race, Nation, and Gender in Literature, 1790–1890 (Michigan, 1998), was a postcolonial analysis of the construction of the Orient in American culture during the 18th and 19th centuries. She has edited a special issue of Prose Studies titled “U.S. Personal Narratives and the Subject of Multiculturalism” and has published a scholarly edition of a slave’s travel narrative, A Colored Man Round the World , by David F. Dorr (Michigan, 1999). She has co-edited three essay collections, Messy Beginnings: Postcoloniality and Early American Studies (with Edward Watts, Rutgers, 2003), Exceptional State: Contemporary U.S. Culture and the New Imperialism (with Ashley Dawson, Duke University Press, 2007), and Dangerous Professors: Academic Freedom and Labor ( with Ashley Dawson, University of Michigan Press, 2009). Her latest book, Locating Race: Global Sites of Post-Colonial Citizenship , critiqing theories and fictions of globalization, and examining forms of Post-Colonial citizenship formulated by Asian-Americans, African-Americans and Native-Americans, was published by SUNY Press in 2009. Her essays have appeared in a journals such as American Literature , American Literary History , Modern Fiction Studies , SIGNS , Cultural Critique , Genders , and Criticism . Her research interests include U.S. empire studies, Asian-American studies, postcolonial theory, critical race theory, and postcolonial women of color. This entry was posted on Wednesday, April 22nd, 2015 at 4:03 pm	and is filed under Daily News, Film Festivals, Home Featured One, IndiePix Films. You can follow any responses to this entry through the RSS 2.0 feed. Both comments and pings are currently closed.